Fallout 4 is a game with a thousand systems all clicking and whirling behind its Boston wasteland. Since one plays this game on PC, those systems are exploited by keying in a few codes and cheats into the developer’s game console. 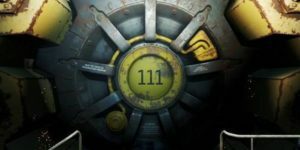 If you are feeling like you want to spice up your fallout 4 inventory by cheating, then the commands below will do you well and they are exactly what you need. With a few command, you can complete your quests, teleport across the world or even access spells that never made it to the final version of the game. To see how various commands work, you have to type them into the developer’s console. To display the console window press the apostrophe button and press enter to activate the corresponding cheat function. To find the code you are looking for while in the guide, press CTRL+f. 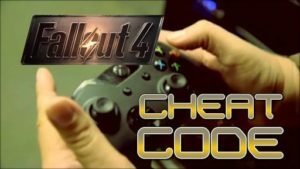 To use fallout 4 commands you will be required to open the developer console screen which can easily be done by tapping the tilde key which is located under the escape key and left of the ‘1’ key on an American Keyboard. 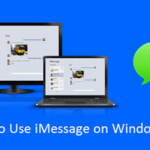 Also Read: iMessage on PC – How to use iMessage on PC? For people using a British English keyboard you will be required to press on the grave (‘) key, but coincidentally they are located on the same place. 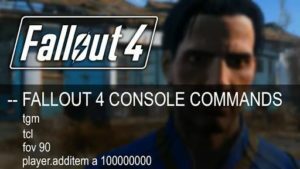 One thing about console commands is that they are not case sensitive so one need not worry about the effect of the caps lock button is pressed during the input of the Console commands. 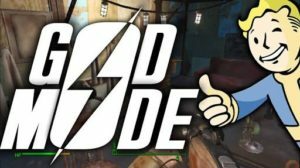 Some examples of Fallout 4 console commands include God mode, Immortal mode, No collision and set skill level among many others. God mode command will turn on God mode, making you invincible. If one needs to turn off the command, all you have to do is type the commands back into the console and will turn it off. To activate the God mode one has to key in the following characters systematically; TGM. To turn on the immortal mode one has to key in; TIM. In this mode, one can take any kind damage but will not die. This may lead to some weird things taking place. They include; your head being removed but your character is still alive. When you key in TCL, you turn on the no collision detection whereby you gain abilities such as walking through walls and at some point you can even defy the laws of gravity. To turn off the command, you will have to key it in again. To toggle off the artificial intelligence of the NPC you will be required to key in Tai. This will leave the system dumber than generation 1 synthetics. To kill everyone in your immediate are and territory you toggle the kill everyone command function. However not all within your area will be killed; your companions and vital characters will be spared and remain alive within your territory. A new feature in the fallout 4 game for PC console is where a user can customize his or her appearance allowing you to redesign your appearance. The command is called customize the character and one has to key in; showlooksmenu player 1. To teleport yourself into a room full of boxes, like an apocalyptic edition of Deal or No Deal you have to key in ‘coc qasmoke’. A hint here is that inside each box is one of every single item in the game. You can add gold to your inventory in this amazing PC game by typing in some console commands. ‘player .additem00000f 100’ The above command will add 100 Gold to your inventory. To add any amount you want, you have to replace the ‘100 ’with a number of your choice and the gold will automatically add to your inventory. In the game you will find many locked doors and you will have to go through them. There is a command which unlocks all closed doors and targeted chests. 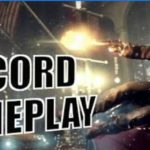 More Read: How to become a verified twitch user? 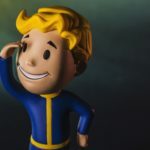 A key factor to note is that Fallout 4 and Skyrim are both built using similar technology in that almost all of Skyrim’s console commands are compatible with Fallout 4. There are many codes for all the different items in Fallout 4 and each of the codes has its own specific function.